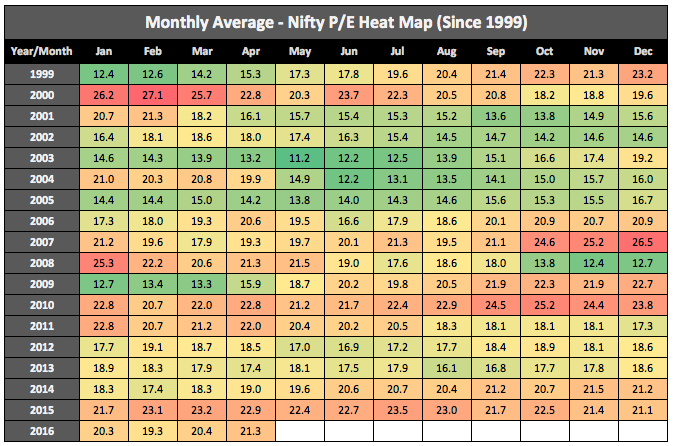 Do Indian Markets Bounce off PE levels of 12 & 24? Sounds like a title of some Technical Analysis writeup? I don’t blame you. 🙂 But rest assured it is not. Infact, this will be an entertaining post for you if you are interested in giving some thought to PE-Based investing. 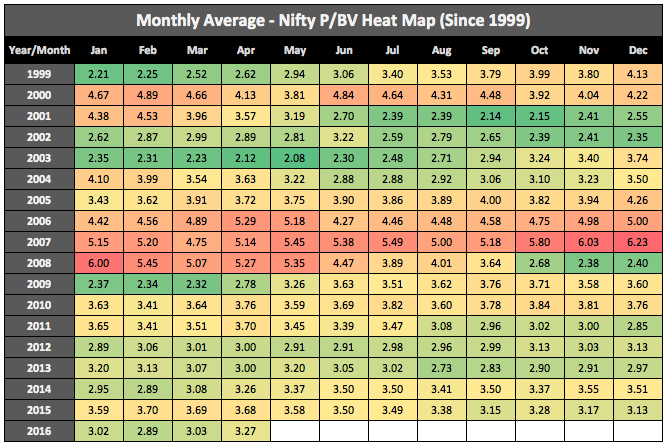 In previous post, I did a detailed analysis of the PE Ratio of Nifty 50 in last 16+ years. It does throw up some interesting insights. But what catches the eye is that there are levels, which the Nifty generally fails to breach on lower and upper sides. There is no doubt that by investing (more) in markets trading at low PE multiples, chances of earning higher future returns increase. Similarly by investing in markets trading at higher PEs, chances of lower future returns increase. It is very simple. But to say that one can time the market on basis of just Index PE will be an over-simplification. As we saw in previous post, the mere fact that expected average returns are high does not mean that the returns you (in particular) get, will be guaranteedon lines of the high averages. It does not work like that. If you are unable to understand this point, I recommend reading the post – especially the example of average depth of river part. Now I did the following analysis in 2012too. There were clear indicators then, that broader indices had a dislike for staying above or below certain PE multiples. Not much has changed in last 4 years. Without getting into the statistical accuracy of numbers, the analysis shows that these PE multiples are PE12 and PE24. The blue line is actual Nifty level. The red line is hypothetical Nifty level at PE24 at that time. The green line is hypothetical Nifty level at PE12 at that time. 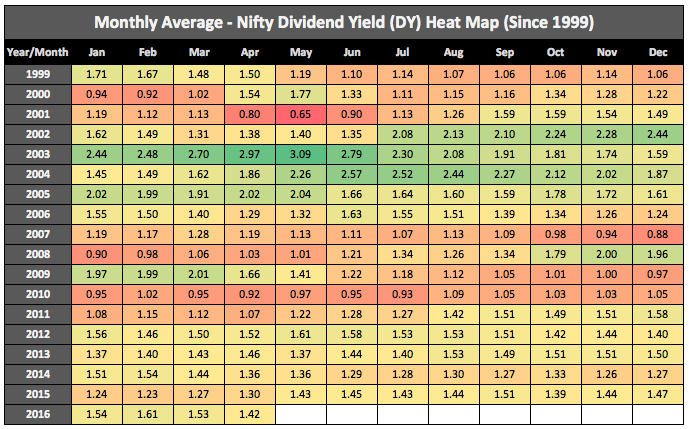 Clearly, Nifty seems to have trouble staying above PE24 (considered highly overvalued) and below PE12 (considered highly undervalued). Whenever it reaches either of these two levels, it seems to bounce off in opposite direction! Buy low (PE). Sell high (PE). If you think it’s timing, then you are right. Buy low (PE). Avoid buying high (PE). Now ofcourse you can say that I should have used PE25 or PE11 to make it more accurate. But the idea here is not to be as accurate as possible. Rather, the idea is to become cautious when markets start moving in irrational territories. Index PE depends a lot on what are the index constituents and other factors. So broadly speaking and ofcourse basing my conclusions on past data, PE12 seems like a clear signal that investors are unreasonably pessimistic and at PE24, over optimistic. Both are unsustainable and hence, indicate near term reversion towards mean. Though nobody can guarantee that markets will behave on similar lines in future, chances of that happening are pretty high. My analysis and conviction is based on the fundamental assumption that India is a growing economy (atleast for next decade and a half). And I believe that markets are highly undervalued around PE12 and highly overvalued as they approach PE24. But ofcourse, you may choose to differ on this and invest accordingly. So instead of getting into this debate, lets come back to the title of the post – Is it safe to say that index bounces off PE levels of 12 and 24? It seems to be true. But note that markets don’t stay at such low/high levels for very long time. So inspite of being sure to invest when PE12 is crossed on the downside, you might find yourself lacking enough firepower (cash) to take advantage of the situation. Just 1% of the time – market has stayed below PE12. Can you catch it? How changes in Index Constituents impact Index PE Ratios and PE Based Investing? I was working on a more comprehensive P/E Ratio analysis of Nifty and Sensex when I thought about bringing this important point to everyone’s notice. In December 2015, Sensex underwent few small changes. Two companies in the 30-share index were replaced. Adani Ports & SEZ and Asian Paints were added to the index and Hindalco and Vedanta were removed (source). I am sure that weak performance of the two outgoing companies combined with a bleak outlook for the metals sector in general, must have necessitated this change. So what will happen when two low profit (or loss-making) companies are removed from the index? By replacing these companies with profits-making ones, the total earnings of Sensex will increase. This would mean a lower PE ratio, which is calculated by dividing the total market cap of the constituent companies in the index by their total net profits. And as we can see from table below, the immediate impact of this change was that PE came down on the day of change, inspite of index going up. So this particular fall is PE is not because of fall in share prices. It is purely because the index constituents have changed and consequently, earnings have increased. For those who thought that markets have come down suddenly in valuations, this is something to make note of. I wanted to highlight this because I regularly make references to link between returns and market PEs and how one can use this indicator to broadly assess market valuations. Extend this concept of change in index constituents and you will realize that when comparison of index’s PE in 2016 is made with say of year 2001, then essentially, two very different indices might be getting compared. Another thing that worries me is management framework of the index. I am sure that the index management committee would be doing their jobs honestly and carrying out required due diligences, when including and excluding companies in indices. But I am not sure whether there are any SEBI norms governing them or index changes.The indices traded on stock exchanges are owned (not sure) and managed by separate legal entities that do not come under the direct supervision of SEBI. I think there is a scope of increasing regulatory oversight here. First of all, I am overwhelmed with the responses I got for the financial concerns and issues survey conducted few days back. Thanks to you all, there are so many feedbacks that I am still reading through all of them. I am not a value investor. And nor can I become one as I don’t have the time to monitor or analyse stocks. But I still want to become a sensible investor who invests more when there is panic around. I have read that it’s wise to Buy Low and Sell High. I don’t want to think much about Selling-High right now, as I am pretty young. But I do want to invest more when everyone else is selling, i.e. I want to Buy-Low. But if I go for individual stocks, it can be risky. For someone like me, it makes sense to stick to mutual funds. But how can I know when to Buy More. Even if I invest regularly, shouldn’t I be buying more when markets are down and I have additional funds? That’s a pretty reasonable concern of the reader. And I think that many among us do not really have the time to become real investors. We are better suited to piggyback on expertise of others. So what I understand from this question is that he wants to become a Value Investor, without bothering too much about picking individual stocks. By the way, I don’t consider myself to be a value investor. At most, I am an opportunist who is interested in buying good companies, at relatively cheap prices and holding them for very long periods of time. And yes…every now and then, I do take up small short-term speculative positions as well. But these positions are small and generally not more than 5% of my overall portfolio size. But jokes apart, it’s a fact that 95 out of 100 people who invest in stocks, would be much better off if they do not invest in stocks directly. They should rather stick with well-diversified mutual funds. And I am saying this not because I consider myself to be an expert or an authority in something (on the contrary, I am a pretty regular guy as detailed in 17 Unknown but Honest Facts about me). But because successful investing is more about our own personalities and discipline rather than just about picking the right stocks. To explain this, lets take an example. Suppose your overall portfolio size is Rs 10 Lacs. Now you consider yourself to be a good investor and find a good stock selling cheaply. But you only invest Rs 5000 out of the Rs 10 lac in this stock. This stock goes on to become a multibagger (10X) – your Rs 5000 investment becomes Rs 50,000. But at an overall level, your portfolio of Rs 10 lacs only moves up by Rs 50,000 (or Rs 45,000 to be precise) ~ to Rs 10.5 lacs. Nothing much to boast of. Right? So it is never just about picking the right stock. It’s also about position sizing and how convinced you are about the stock (and a thousand other factors). Successful value investing is also about being prepared for the rare investment-worthy opportunities. This means that even if you have chosen the right stock, and are ready to allocate a significant part of your capital to this stock, you still need to have the cash to invest in the opportunity. Because if you don’t, you cannot become a value investor, of for that matter even a decently good investor. So what should an individual who wants to do value investing, but not through specific stocks, do? The answer is not very complicated. But there is a catch, which I will disclose after giving the solution. Identify situations when it makes sense to invest additional money. It is not difficult to identify situations where it makes sense to invest more (and as much as possible) for an average investor. A real value investor can go and find undervalued stock in a bull market. But an average investor needs to be right first and then think about the return percentages. And chances of being right with individual stock picks are lower than that of being right about investing in a group of companies. So here is an indicator (or rather 3), which give you helpful advise about when to invest more. If you go through these above tables you will realize a clear correlation between these indicators (P/E, P/BV and Dividend Yields) and Returns you can ‘expect’ to earn when you invest on basis of these indicators. And here, by investing I mean – investing in a large group of stocks and not in individual stocks. It is as simple as that. And a few years back, I even found a range of P/E ratios, which seem to control Indian markets. You will be surprised to see how clear this PE Band is!! I was mightily surprised when I say it first. Here is another interesting analysis of how much time Indian markets spend at various PE levels. Now you would want to know how to track these indicators regularly. The answer is that you can either track it using this link on NSE’s website. Or you can check out monthly updations, which I make to State of Indian Market page. Now comes the second part. Once you know that it’s a no-brainer to invest at a particular moment, and you have the cash power to do it, the question is where to invest. I know you would love to invest in individual stocks, see them become out-of-the-world multibaggers and boast of being a great stock picker. But lets be honest. It’s not easy at all. Even expert investors are unable to find great stocks easily. So for all practical purposes, individual stock picking is best avoided by average investor. End of discussion. So where does one invest? The answer is… in a group of stocks. A well diversified selection of stocks belonging to various industries, which as a group help in mitigating the risk of getting it wrong by investing in individual stocks. Yes. I am talking about mutual funds. Invest regularly in a few good mutual funds through SIP. Keep a regular track of P/E, P/BV and Dividend Ratio (DY) of overall market. If markets go down and with it PE, PBV goes down and DY goes up, you would do well to invest additional money in these mutual funds. If the thought of investing more when your portfolio is going down does not make sense to you, then you need to rethink whether stock markets are a place for you or not. The above approach is like giving booster shots to your portfolio when markets are going down. I have done a comprehensive 4-part analysis on investing more when markets are down. Results of the analysis were surprising as it proved that just by keeping it simple, i.e. investing a constant amount regularly still made a lot of sense for majority of investors. But if you have additional money, which you can invest and forget for few years, don’t hesitate to put it in mutual funds. I hope that with this post, I have been able to clarify on how to become a value investor by using just plain, simple mutual funds. Let me know if you all have any questions or suggestions for this post. It will help me improve future posts addressing financial concerns. Note – Whenever you think about investing in stocks or mutual funds, make sure that you are doing it for atleast more than 5 years. There have been 5-year periods when stock markets did absolutely nothing.